w.r.t. What is Google Docs? Actually, I do not recall anymore exactly how I got there but I learned playing Go in summer 1979 in the smallest of 5 Berlin Go Clubs. For several months I did not imagine that there were many other players playing Go ... until the first tournament came up ... and I became addicted fast. For some time (2 years?) - not I was playing Go, rather Go was playing me. Still, I could say I also benefitted as a whole (besides Go) from it (learning languages, visiting countries while going to tournaments, trading there, learning s.th. about myself), despite that there might be shorter ways to achieve these goals for life (language courses, philosophy books, studying more in earnest at university). If you ask someone about his/her promotion speed in Go, it's likely that often the times get shorter the longer ago that took place. Facts are that I was around 15kyu? in Mali Losinj (1980? *, YU), 4kyu in Linz (1981, AT), 1kyu in Kopenhagen (1982, DK) and about 1985 3dan. You see, I must check the dates. I'm sure about the place, but not about the date anymore. Jan van der Steen's all-encompassing, incredible Go, an addictive game-site hosts internet books as Charles Matthews one's on ko. (Which is another eye opener) Good for teaching shape in the club is Shape up! also by Charles (and a Korean Pro). I learned something new there too. Goproblems which I use to practice on and where I occasionally comment. In the near future I would like to contribute some (more) problems. Very hilarious are these comics or these. Concerning the history of WeiQi/Go QiJing ShiSanPian is interesting. I like combinations more than e.g. fuseki or esp. joseki, endgame where I consider myself now weak for a 3 dan. Being quite quite a slow player, non-byoyomi games can be a nightmare with any allotted time, and I lost several very often just because of time management problems. I enjoy café­-house type games with lots of fun talking and prefer them much over impersonal internet games. Didn't play (much) Go from 1995-2002 due to work, exams, children (was less than ten times at the club). Except Isle of Man 1991 (won it, Matthew MacFadyen was bird watching, Francis Roads lost and Christian Wohlfahrt came late), a weekend in Lippstadt 1992 (played my one and only game with Zhao Pei, who just had arrived) and one week in Maastricht 1994 I, cannot remember having participated in tournaments from 1989 to 2001 (1999, 4 games in Augsburg; 2003 K? 2004 Eindhoven + Fast-Go in Almere). Therewith I forgot much Joseki- and/or Fuseki- knowledge of the little bit I knew in the 80's. What is left seem to be only rudimentary opening principles and so I try to rely on that and good shape. The motto: "Finding one's own way within the Fundamentals of Go" is nice. Reading a book on Fuseki might help me to overcome my time problems in the beginning (no need for inventing it oneself). Regularly I go through tsume go and tesuji problems, which also kept me fit through those 10 years of relative absence. The most obvious and difficult is of course to participate in tournaments. Just founded a Go club named Go4Go at work (Jan. 2003) (see here: EmployersWithGoClubs). In August 2003 we had 30(!) paying members (20,- EURO/year) of whom 8-12 come regularly to my teaching lessons (shape, shape, shape and sente/gote, basics of semeais, opening, extensions, invasions ... and everything what comes up during their games) and play once a week for sometimes two hours (12:00-13:45). Due to to the short time, we played for about six months on 13x13 boards and only then made the switch to the big one. We did not yet pay much attention to our individual ladder rankings, i.e. don't fill in the results and do not know the exact kyu strength (20-15 kyu, I guess). Yet, it is already possibly (4-6 months afterwards) to see some differences among the students, i.e. twice white groups where killed by the same persons (didn't affect the outcome, white won) and and our 7 kyu lost handicap games against the newcomers. I realize that two hours once a week is much to few time spent on Go, hence I encourage them to play online or to join a club. [1 year after founding: one girl visits an outside club and makes recognizable progress, giving up to 6H to others] Several learnt the game 20 to 30 years before, some (1) are even joining a normal evening club occasionally. Speediest learner is now lololibo, 10 kyu (summer 2004) after having started in Oct. 2003. Lololibo won his first 9H game against me (Jan. 17, 2005) - ok, it was simultaneous as it often is, but I lost it all on my own. Often, during the simultaneous, I show some sequences they could have played, but not during this game. Feb. 2005: Lost a big corner group in ko after neglecting a fine threat of Geraoid in a 9-H game (still won the game). The guys (and girls) are losing the respect - and stubbornly go for the kill! Losing (9H-games) to one's pupils is one of the nicest rewards for teachers. 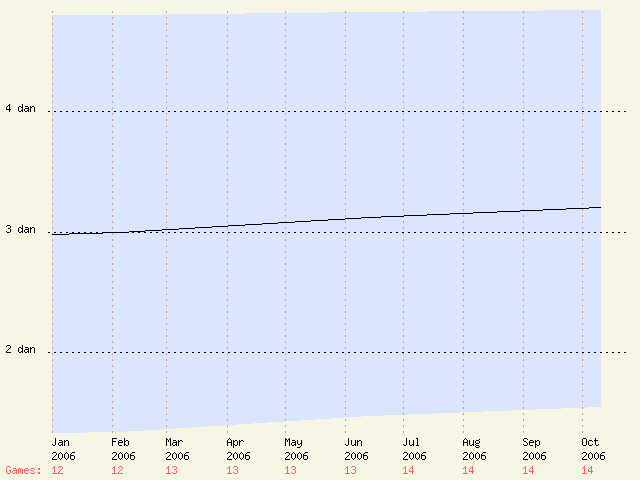 March: 2005: May2005: A big improvement happened also to L. who happened to enter the Club as ~6k. Now he is playing at 3k and challenging M. (1k 12 years ago) on even. I do have another account with much more games, but find it too embarassing to disclose. I use it mainly for fast games and it is meant to overcome my time management problems. Time Management is my personal problem. (Finding a good move in the available time is better than searching for the best move and lose on time). GIP = "Good instead of Perfect"-principle. Recently it became a 2kyu account after some net-lagging or computer problem (and time problems and bad play of course). tderz: Merci! You can(not) have "the best of 2 worlds" (Best moves in Short time; freely interpreted Candide). Voltaire teaches (in Candide) that man is incapable of understanding the evil in the world, and concludes that the fundamental aim in life is not happiness, but survival. (= in Go: to end the game in time). I would like to get an AGA rating. check out the Feng Yun-path. Velobici: You mentioned on the Weiqi Tiandi page that you have material to place on the Internet but are missing a website. I could provide you a website for this material, if you are interested. tderz Basically, it's lack of time. What did I write there. I have to check what material I was writing about. Thank you for the offer, Velobici. You could send me the information to my e-mail address. Velobici: will do. Naturally, you can delete this whenever you wish. Velobici: does the Contemporary Go Terms have tone numbers at least if not the proper diacritical marks in the pinyin? tderz: No, but I plan to copy them all from ChineseGoTerms into the book, thereby learning & practising them (again). The book has a nice small layout: 19cm x 14 cm. What is obviously missing: hiragana, katakana + Hangul-alphabet table which would be very useful for all those word entries which are not in the book. I'll plan to add those tables into the book. Alex: Okay, I'm about ready to start sending copies of the first draft of my book to people for proofreading. Email me at "alex at omniheurist dot net" if you're still interested. Ok, did it. I'm still interested. Hauw? Hello Alex, may I know what book you are writing on? RobertJasiek: A new book has appeared: Capturing Races 1.
in a website. It is the nicest I have seen so far. It even handles variations. It is now also used on GoDiscussions the new moderated forum, which is so much more powerful and appealing than rec.games.go. A While ago s.o. suggested here to store introductionary a.o. Go teaching materials somewhere. Maybe this is a good place for it?